Yeah, I admit it. I have a pretty decent job. In this economy when most are doing they best they can to make ends meet, actually getting paid and enjoying the heck out of your work is quite a blessing. I just returned from a few days of zoo consulting work. Even though I worked a number of animal related jobs as a teen and through my college years, I started my real animal training career working as a zookeeper 19 years ago. 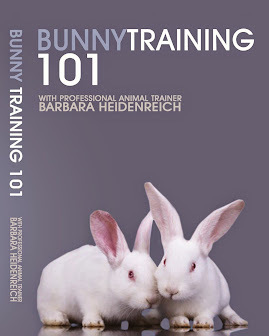 It was there I was introduced to training animals with positive reinforcement and have stuck with it ever since. In those 19 years I have met a lot of animals....and certainly parrots are probably the ones I have met the most now that I also lecture extensively to the companion parrot community. But even with the parrots, every single time I meet an new animal it is an adventure. 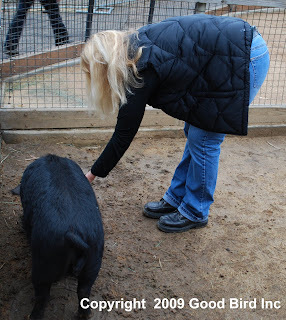 Although I occasionally get some time to interact with the animals myself. 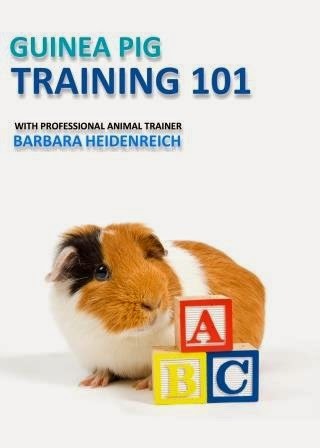 My job is really to coach those who already have a relationship with the training subjects. But did I get to pet Pigloo? and feed biscuits to a gorilla? and get sniffed by a giraffe? Happily.... the answer is yes! Although I love the animal encounters, there are other parts that mean just as much to me. I so enjoy when I get feedback that the material/information I offer has been helpful. This was a super appreciative audience. Plus they sacrificed a lot of their free time to take advantage of the few days I was there. That is HUGE! And it was a big positive reinforcer for me that they were willing to spend so much time with me. And of course, I always learn something new too. While I have been fortunate to work with the species mentioned prior to this trip, every animal is an individual and every situation presents it's own unique challenges. Therefore there is always a bit or brain power involved to get the job done. I love that! There were a number of "feel good" training moments in this trip. The elephant session, turkey vulture, and pigs maybe stand out the most for being thrilling in the sense that we really saw the animals learning during their sessions. So now it is onto other events. 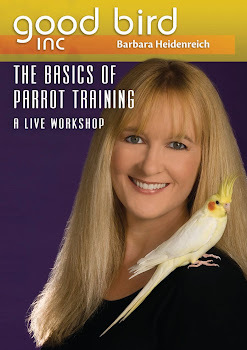 Next up, I will be teaching a parrot training seminar at Cornell University. (I think that makes 4 vet schools now for me?) A few years ago I was invited to speak at my alma mater UC Davis. The event was one I had attended 20 years earlier as a student. I even brought the seminar notebook I had received all those years ago to show everyone. You can even see where my Amazon parrot had made his mark on it. I had him in my life, even way back then. I often get emails from people asking to be stuffed in my suitcase when I head out on the road. OK, but you must weigh less than 50 lbs or I get charged extra at check in. Seriously, I would love for everyone to share in the experience. It is for that reason I became a part of the Twitter community. If I can squeeze in a moment I try to offer a little "tweet" to fill followers in on the day to day activities of an animal training consultant. You can become a follower at this link here. It also automatically updates on my Facebook and if I can figure out how to do it...on my blog here. Wish me luck! As a proponent of positive reinforcement training, one of my goals is to avoiding doing anything that creates the situation in which a parrot may be inclined to bite. That means avoiding force, reinforcing for desired behavior like stepping onto my hand when cued or off as the case may be, and paying close attention to my parrot’s body language that says “back off”…..and respecting it by doing just that. In the long run these strategies make it less likely the bird will be inclined to present aggressive behavior in the future. Trust is built as the parrot learns I wont force him to do anything against his will and if he chooses to present certain behaviors (like stepping up) he earns desired outcomes….which often means treats. Yea! 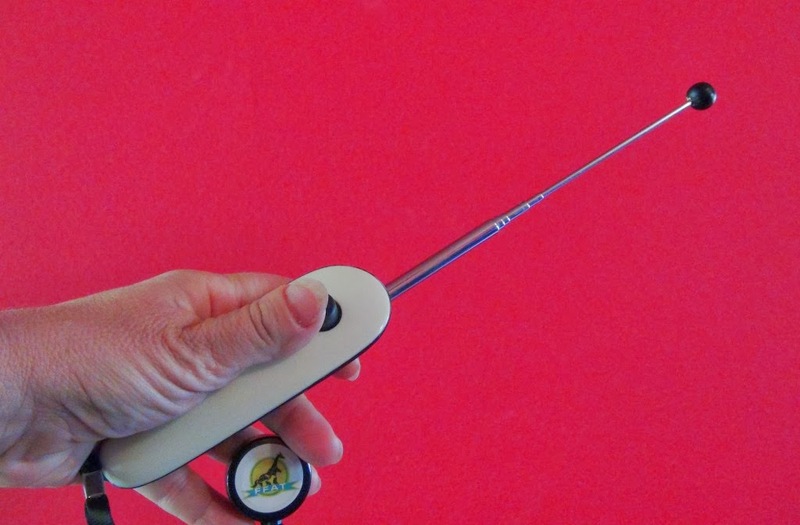 However I thought I would share a few “techniquey” type things I have been using for years. Meeting parrots for the first time is a big part of what I do when I travel to teach seminars. 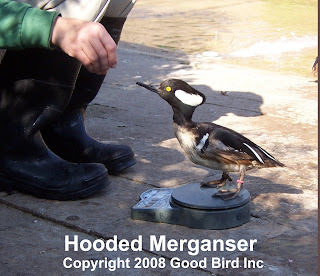 Many of these birds have histories that may have taught them to present aggressive behaviors towards hands. However I purposely ask the owners to refrain from telling me the parrot’s histories. This is because I want to base my actions on what the bird shows me with his body language. 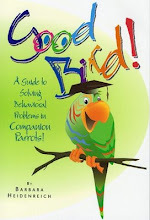 If I am unsure I have a few little strategies that help me have some confidence as I start to interact with the parrot. When asking a parrot I have just met to step up for the first time, I often keep my hand in a tight closed fist as pictured above. If a bird tries to bite, my first choice is to pull my hand and the treats away (time out from positive reinforcement aka negative punishment) But even the best of us may not react fast enough. Having your hand in a tight fist makes it difficult for the parrot to grab a hold of anything with his beak. I still don’t leave the fist there for the bird to gnaw on…I am not trying to flood the bird to accept a hand. The fist is just to avoid injury should I fail to respond to the parrot’s signals fast enough. My final tip has to do with my hair. Some parrots show quite an adverse response to hands. In those cases I will sometimes lower my head and see if they might like to play with my hair. I offer the very top of my head as once again there is no flesh they can grasp. Many times parrots will start preening or playing with hair. This in some cases can get some pleasant interaction going with a parrot. Keep these tips in mind when you are meeting a parrot for the first time or if you have a parrot that presents aggressive behavior. Hope they help. All day long I found myself saying "lovely fatty bum, bum." Why you may ask? It is this dude's fault. 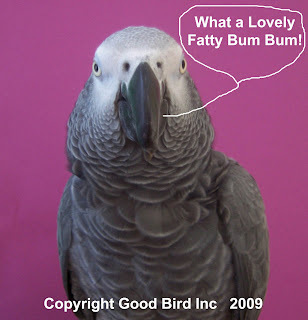 This particular you tube clip has cracked me up more than his famous potty mouthed parrot (warning! not for those offended by curse words). I am not sure if it is the accent (Americans love those English accents), the phrase or perhaps that he is just having a fabulous time playing with his dog. Or maybe it is just that everyone needs to hear they have a lovely fatty bum, bum from time to time. Here is one for you dear reader "lovely fatty bum bum!" Sometimes this means typing with one hand as I give a nice little preen to my cockatiel. Usually I try to make my work time, fun time for my parrots. The cockatiel not only visits with me but also wanders around the window sill where I stash lots of parrot safe toys. Several times a day I also take short breaks for training sessions. I actually find them a nice relief from the computer and of course my parrots benefit as well. A session might be followed up by lunch for me and more playtime on the counter for my birds. When my brain can't take any more work, I do like many and find TV to be a nice way to clear out thoughts about work and drift into someone else's story. This too is also parrot time, as my Amazon parrot of 21 years likes to make sure my eyebrows get a good preening. It's Extreme EyeBrow Make Over for me if he is on a roll. Amazon smell for me is associated with all things warm and fuzzy from the many years of enjoying sharing my life with an Amazon parrot. Hope you get a warm fuzzy feeling all over from your parrots too! I think I found my favorite quote for 2009 already. Here it is "Maybe if more people had a duck in their life...we wouldn't be so mad at each other"
I love it! It comes from this great little news piece sent to me from a friend in St Louis. It is about a man and his duck. One of the reasons this man has such a great relationship with his duck is that this duck is imprinted on humans. This means it was raised by humans instead of another duck. Ducks are precocial meaning they are pretty self sufficient as soon as they hatch. Parrots and many other bird species are altricial. They are quite helpless when young and require a great deal of care as they mature. Hand fed parrots are those that are typically pulled from the nest at a young age or incubator hatched and fed parrot feeding formula. They imprint on humans and tend to be fairly comfortable around people. I am not a breeder so cant elaborate on all the various ways young parrots are raised. But I can say that a hand raised parrot is usually easier to work with for most parrot owners. However that is not to say that parent raised birds can’t learn to be comfortable around people. 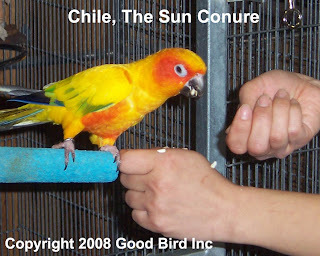 I have been fortunate to work with a number of parent raised birds to train for shows and zoos. They do require a bit more patience and it is extremely important to not rely on coercive methods to get behavior. But in both situations, hand reared or parent reared what matters most is what happens after weaning. This means positive reinforcement approaches to working with the bird are what is most critical. 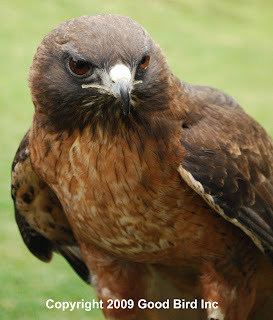 A seemingly great hand raised bird can learn to present aggressive behavior if heavy handed training strategies are in play. That once sweet baby can become the biting terror due to our own handling mistakes. That is why learning how to avoid coercion is critical. Coercion is a difficult concept to grasp sometimes. My terminology page has a nice definition of it. Even gently prying a toe off of the perch is coercion. Try to practice letting your bird choose to participate to keep things far from the realm of coercion. The pay off is a great relationship with your parrot, whether he was hand raised, parent raised, wild caught, adopted, re-homed, abused or all of the above!